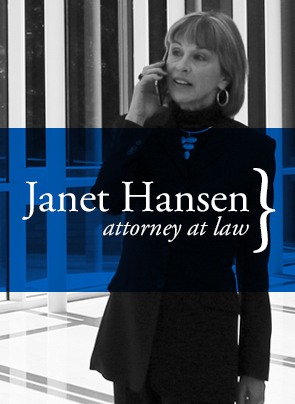 Janet Hansen has spent most of her legal career representing persons who have been injured by the wrongful acts of others. Her career began with briefing attorney and legal research experience at the Texas Court of Appeals and the U.S. District Court for the Southern District of Texas. Later, as an associate in the firm of Jamail & Kolius for 30 years, she prepared and tried cases alongside the undisputed King of Torts, Joe Jamail. These experiences developed the organizational and intellectual skills necessary to investigate, develop, prepare and present even the most complex case for trial. Ms. Hansen opened her own office in January 2013 to continue to offer her services in the field of tort litigation to injured persons and their families. She is also available to consult with other attorneys in the discovery and trial phases of personal injury cases. Her experience has involved cases with catastrophic personal injuries and wrongful death – those caused by defective products, drugs and medical devices, pipeline and chemical plant explosions, serious motorcycle and trucking accidents, defective automobiles and many others. Over the years, Ms. Hansen has worked with and against the top lawyers in the field of personal injury and has earned their respect as an efficient, organized, smart opponent. Ms. Hansen sincerely believes that those harmed by the wrongful acts of others have the right to receive justice and to be rightfully compensation for their monetary losses as well as the emotional pain and suffering caused by the wrongful conduct.